Pope Clement VII (Latin: Clemens VII; 26 May 1478 – 25 September 1534), born Giulio di Giuliano de' Medici, was Pope from 19 November 1523 to his death in 1534. He was born in Florence one month after the assassination of his father, Giuliano de' Medici, following the Pazzi Conspiracy. Although his parents had not had a formal marriage, a canon law loophole allowing for the parents to have been betrothed per sponsalia de presenti meant that Giulio was considered legitimate. He was thus the nephew of Lorenzo the Magnificent, who educated him in his youth. Clement's mother, Fioretta Gorini, also died leaving him an orphan. Giulio was made a Knight of Rhodes and Grand Prior of Capua, and, upon the election of his cousin Giovanni de' Medici to the pontificate as Leo X (1513–21), he soon became a powerful figure in Rome. 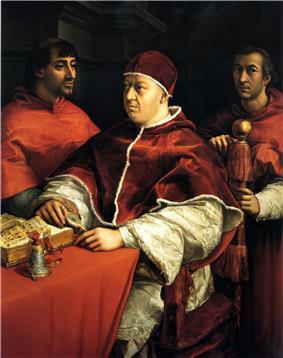 Upon his cousin's accession to the papacy, Giulio became his principal minister and confidant, especially in the maintenance of the Medici interest at Florence as archbishop of that city. On 23 September 1513, he was made cardinal. He had the credit of being the main director of papal policy during the whole of Leo X's pontificate, especially as cardinal protector of England. He was also the titular Bishop of Worcester in the county of Worcestershire in England as Administrator of the See of Worcester. At Leo X's death in 1521, Cardinal Medici was considered especially papabile in the protracted conclave. 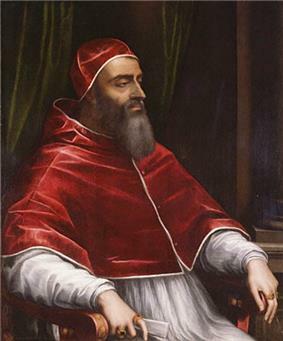 Although unable to gain the Papacy for himself or his ally Alessandro Farnese (both preferred candidates of Emperor Charles V (1519–56)), he took a leading part in determining the unexpected election of the short-lived Pope Adrian VI (1522–23), with whom he also wielded formidable influence. Following Adrian VI's death on 14 September 1523, Medici finally succeeded in being elected Pope Clement VII in the next conclave (19 November 1523). He brought to the papal throne a high reputation for political ability and possessed in fact all the accomplishments of a wily diplomat. However, he was considered worldly and indifferent to the perceived dangers of the Protestant Reformation by the people of the papacy. At his accession, Clement VII sent the Archbishop of Capua, Nikolaus von Schönberg, to the Kings of France, Spain, and England, in order to bring the Italian War to an end. But his attempt failed. Francis I of France's conquest of Milan in 1524, during his Italian campaign of 1524–1525, prompted the Pope to quit the Imperial–Spanish side and to ally himself with other Italian princes, including the Republic of Venice, and France in the January of 1525. This treaty granted the definitive acquisition of Parma and Piacenza for the Papal States, the rule of Medici over Florence and the free passage of the French troops to Naples. This policy in itself was sound and patriotic, but Clement VII's zeal soon cooled; by his want of foresight and unseasonable economy, he laid himself open to an attack from the turbulent Roman barons, which obliged him to invoke the mediation of the emperor, Charles V. One month later, however, Francis I was crushed and imprisoned in the Battle of Pavia, and Clement VII veered back to his former engagements with Charles V, signing an alliance with the viceroy of Naples. But he was to change sides again when Francis I was freed after the Treaty of Madrid (1526): the Pope entered into the League of Cognac together with France, Venice, and Francesco Sforza of Milan. Clement VII issued an invective against Charles V, who in reply defined him a "wolf" instead of a "shepherd", menacing the summoning of a council about the Lutheran question. In his bull "Intra Arcana" he advocated a militaristic means of evangelizing "by force and arms, if needful" which contrasts with the more peaceful admonitions of his successor Paul III in his bull "Sublimus Dei". The oldest indult which Benedict XIV quotes in this connection is that granted by Clement VII to the Dominicans of the Convent of Forlì, 25 January 1526, to celebrate the Mass of Blessed James Salomonio "as often during the year as their devotion may move them to do so" (De canonizatione de SS.). 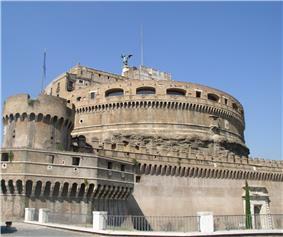 Soon he found himself alone in Italy too, as Georg von Frundsberg to reach Rome without harm. In June of the next year the warring parties signed the Peace of Barcelona. 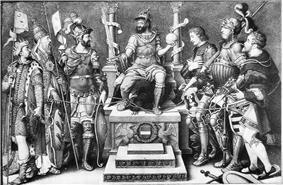 The Papal States regained some cities, and Charles V agreed to restore the Medici to power in Florence. In 1530, after an eleven-month siege, the Tuscan city capitulated, and Clement VII installed his illegitimate nephew Alessandro as duke. Subsequently the Pope followed a policy of subservience to the emperor, endeavouring on the one hand to induce him to act with severity against the Lutherans in Germany and on the other to avoid his demands for a general council. By the late 1520s, King Henry VIII wanted to have his marriage to Charles's aunt Catherine of Aragon annulled. The couple's sons died in infancy, threatening the future of the Tudor dynasty, although Henry did have a daughter, Mary Tudor. Henry claimed that this lack of a male heir was because his marriage was "blighted in the eyes of God". Catherine had been his brother's widow, but the marriage had been childless, thus the marriage was not against old-testamentical law, which forbids only such unions if the brother had children. Moreover, a special dispensation from Pope Julius II had been given to allow the wedding. Henry argued that this had been wrong and that his marriage had never been valid. In 1527 Henry asked Pope Clement to annul the marriage, but the Pope refused. According to Catholic teaching, a validly contracted marriage is indivisible until death, and thus the pope cannot annul a marriage on the basis of a canonical impediment previously dispensed. Many people close to Henry wished simply to ignore the Pope; but in October 1530 a meeting of clergy and lawyers advised that the English Parliament could not empower the Archbishop of Canterbury to act against the Pope's prohibition. In Parliament, Bishop John Fisher was the Pope's champion. Henry underwent a marriage ceremony with his mistress, Anne Boleyn, in either late 1532 or early 1533. The marriage was made easier by the death of the Archbishop of Canterbury William Warham, a stalwart friend of the Pope, after which Henry persuaded Clement to appoint Thomas Cranmer, a friend of the Boleyn family, as his successor. The Pope granted the papal bulls necessary for Cranmer’s promotion to Canterbury, as he also demanded that Cranmer take an oath of allegiance to the pope before his consecration. Laws made under Henry already declared that bishops would be consecrated even without papal approval. Cranmer was consecrated, while declaring that he did not agree with the oath he would take. Cranmer was prepared to grant the annulment of the marriage to Catherine as Henry required. The Pope responded to the marriage by excommunicating both Henry and Cranmer from the Catholic Church. Consequently in England, in the same year, the Act of First Fruits and Tenths transferred the taxes on ecclesiastical income from the Pope to the English Crown. The Peter's Pence Act outlawed the annual payment by landowners of one penny to the Pope. This act also reiterated that England had "no superior under God, but only your Grace" and that Henry's "imperial crown" had been diminished by "the unreasonable and uncharitable usurpations and exactions" of the Pope. Ultimately Henry led the English Parliament to pass the Act of Supremacy (1534) that established the independent Church of England and breaking from the Catholic Church. During his half-year imprisonment in 1527, Clement VII grew a full beard as a sign of mourning for the sack of Rome. This was a violation of Catholic canon law, which required priests to be clean-shaven; however, it had the precedent of the beard which Pope Julius II had worn for nine months in 1511–12 as a similar sign of mourning for the loss of the papal city of Bologna. Towards the end of his life, Clement VII once more gave indications of a leaning towards a French alliance, which was averted by his death in September 1534 in Rome after consuming a death cap mushroom (Amanita phalloides). His body was interred in Santa Maria sopra Minerva. As for the arts, Clement VII is remembered for having ordered, just a few days before his death, Michelangelo's painting of The Last Judgment in the Sistine Chapel. ^ "List of Popes," Catholic Encyclopedia (2009); retrieved 2011-11-16. ^ a b "Pope Clement VII," Catholic Encyclopedia; retrieved 2013-10-21. ^ Society for the Diffusion of Useful Knowledge. (1837). "Clement VII," Penny cyclopaedia, Vol. 7, p. 250. ^ Corkery, James and Thomas Worcester, The Papacy Since 1500: From Italian Prince to Universal Pastor, (Cambridge University Press, 2010), 29. ^ Stogre, Michael (1992). That the world may believe: The development of papal social thought on aboriginal rights. ^ Phillips, Roderick (28 June 1991). Untying the Knot: A Short History of Divorce. ^ Cranmer, in a letter, describes it as a divorce, but it was clearly not a dissolution of a marriage in the modern sense but the annulment of a marriage which was said to be defective on the grounds of affinity—Catherine was his deceased brother's widow. Wilkie, William E. (26 July 1974). The Cardinal Protectors of England: Rome and the Tudors Before the Reformation. New York and London: Cambridge University Press.